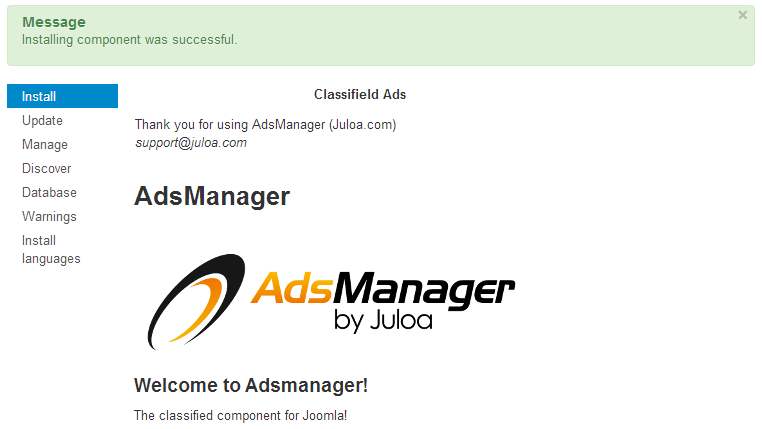 The AdsManager component can be installed on Joomla 1.5, 2.5 and 3.0. Installation is performed the same way on all versions. AdsManager is available as either a FREE version or as a pack (Bronze, Silver, Gold). To download or test the free version you can click on the "Try Now" button to test a demo site or download AdsManager Free by clicking on the link "Download" on the menu. If you want more functionalities, you can buy different packs of AdsManager (Bronze, Silver or Gold) by clicking on the purchase links on the AdsManager article. Then scroll down the page and click on the "Purchase" button for the pack you need. A comparative table describing each pack is available on Joomprod. Just go on the AdsManager article and click on the comparative chart button. You can use a coupon if you have one. If you don't have Paypal, see Frequently Asked Questions on Joomprod. Thanks for buying AdsManager ! Once the gold, silver or bronze pack has been purchased and downloaded, the component can be installed like any other Joomla component. To access the zip folder of AdsManager, you need to unzip the file you just download, the component will be inside it. Choose the installer file in the first field and choose Upload & Install.